Looking like it sprang from the original “Batman” cartoon as a car piloted by The Penguin’s henchmen or an extra from “The Godfather” films, this big, black Buick Special Model 47 “Slantback” sedan from the Art Deco Period is a looker. Buick claimed the 1937 Series 40 four-door sedans could accelerate from 10 to 60 mph in 19.2 seconds, an astounding feat at the time. The Special was Buick’s gateway vehicle, full-size car and this was the second year for the company’s new model name plus series number naming scheme. Dressed in black, this car’s paint and trim are in good, original condition. 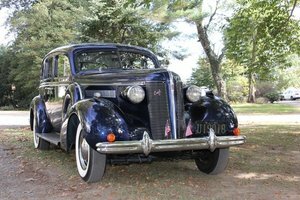 Franklin Hershey penned the restyling of 1937 Buick lineup. He gave the cars split horizontal bar grilles and longer fenders with blunt trailing edges. Headlights continued their slow march from flanking grilles to becoming the leading design elements of the front fenders. The 1937 Special set 1.5 inches lower than the previous model year without skimping on interior space as the floors were lowered 2.5 inches. This car exhibits solid bodywork, its chrome bumpers and bumper guards are in very good order. Some chrome parts were refinished since 2013. However, various side windows are cracked. Note the original, “WE STAND WITH ROOSEVELT” bumper sticker in the rear window and 1937 Florida license plate. For 1937, the Special’s wheelbase increased to 122 inches. The straight eight-cylinder valve-in-head engine was also new-for-1937 and displaced 248 CID. It had a quieter overhead valve mechanism than before, “streamlined” intake valves, a new oil pump and a new cooling system with seven percent larger capacity. This engine has new spark plugs and some work on the four-wheel hydraulic brakes was performed earlier as stated by the previous owner. It has five main bearings and a Stromberg AA1 carburetor. Backing this long motor was a three-speed sliding gear manual transmission with a floor shifter, a single dry plate clutch and a semi-floating rear axle with hypoid gears and 4.44:1 gearing. Driver convenience features included “Knee-Action” front suspension and front and rear stabilizer bars for better road control. This Buick rides on Coker Classic wide whitewalls, size 6.00-16 at all four wheels. Each Coker is wrapped around a steel wheel topped with a factory wheel cover. The tires and wheels are all in very good condition. Inside, behind the conventionally-hinged front doors and the coach-style rear doors, the spacious tan interior is in overall, good, original order, including the front and rear bench seats, the carpet and the headliner. A cord on which to hang winter coats, blankets, scarves, shawls, etc., traverses the rear of the front seatback. The car has a newer, three-spoke steering wheel while its timeless instrument panel, gauges and inner door panels are in the same shape as the seats, carpet and headliner but the fuel gauge and horn are inoperable. Competition to this Buick Special in 1937 included Cadillac’s Series 60, Chrysler’s Airstream, LaSalle’s Series 50, the Lincoln-Zephyr, Packard’s One-Twenty, Oldsmobile’s Series L and Pontiac’s Silver Streak. This car is currently located at our facility in St. Louis, Missouri. Current mileage on the odometer shows 70,391 miles. It is sold as is, where is, on a clean and clear, mileage exempt title. GET OUT AND DRIVE!! !